These are the official Peppa Pig, George Pig, Mummy Pig & Daddy Pig licensed characters, Peppa Pig, George Pig, Mummy Pig & Daddy Pig. Rainbow Productions holds the UK’s official licence to manage the personal appearances of these famous at public events on behalf of the brand owner. Since first airing in 2004, Peppa Pig has gone on to become one of the world’s best-loved preschool characters. Now shown in over 180 territories globally, the show is a bonafide hit with families everywhere. In addition to the television series, the character has spawned merchandise and spin-offs such as books, toys, films and even a theme park. As such, it’s a well-known and universally accessible franchise that is ideal for a range of kids’ events. 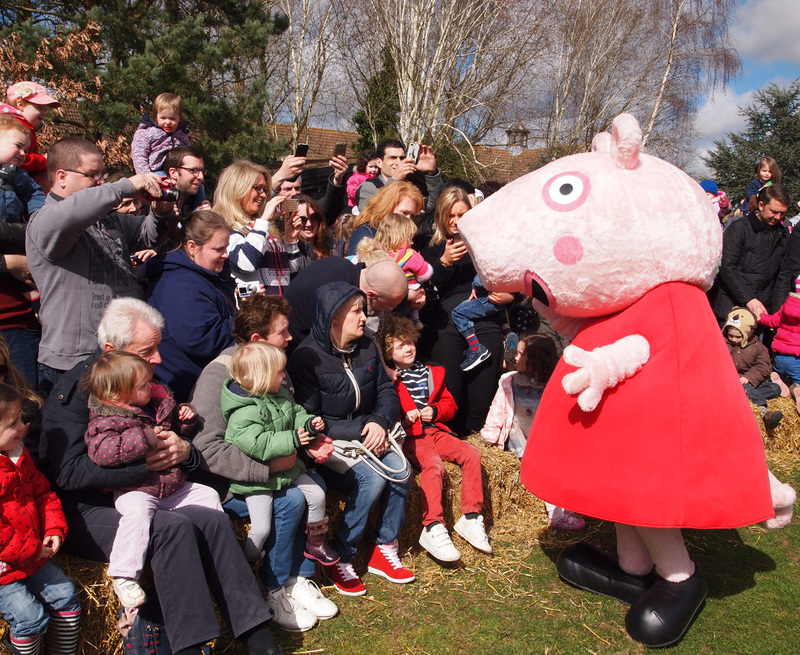 Whether it’s a product launch, a fete, festival or indeed any other children’s event, professional, authentic Peppa Pig costume hire can make an impact. 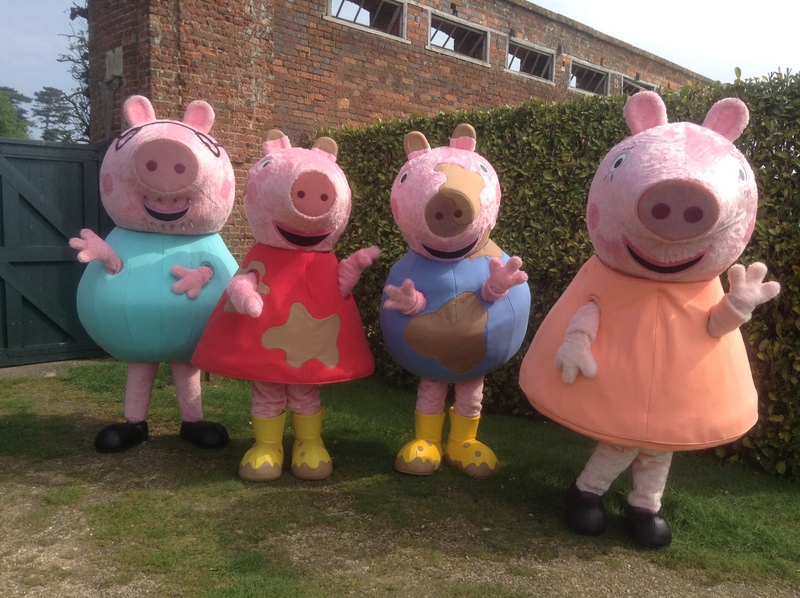 Other agencies may have pig costumes that are in fact only lookalikes or imitations, so when you need the real deal, turn to Rainbow Productions to arrange the hire of an official Peppa Pig mascot. You can be sure of high quality costumes as well as the total professionalism of our talent so you can arrange your next event with confidence. Of course, no Peppa Pig appearance would be complete without the accompanying characters. If you want to really make a standout impression, you can book the whole family to attend your event. We have official Daddy and Mummy Pig costumes that can help create an authentic experience for children. We want little ones to have the most believable interaction possible, which is why we also hold the official license to Peppa’s best friend, George Pig. All of our costumes are worn by trained professionals who know how to interact with kids whilst remaining in character, so your children can really feel as though they’ve met their television favourites. All characters will have a minder present at all times to help them remain in character whilst interacting with fans, and the minder will also ensure the characters are only ever visible to the public in costume. We take great pride in providing the most enjoyable and realistic experience possible to help visitors at your event create lasting happy memories. 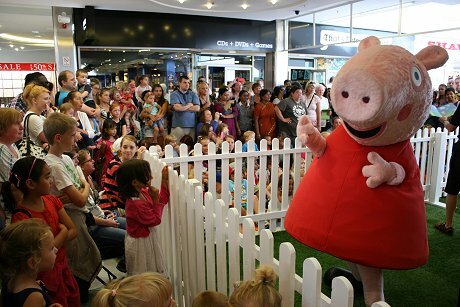 To find out more about hiring Peppa, George, Mummy and Daddy Pig for your next event, contact us today. Peppa Pig is a cheeky little pig who loves to jump in muddy puddles, especially with her little brother George, Mummy Pig and Daddy Pig, which always ends in snorts of laughter. She is charming and caring but can be somewhat bossy. George is the baby of the family and loves playing with Peppa and his favourite toy dinosaur. Mummy Pig works from home and is very clever. She is sensible except for when it comes to jumping in muddy puddles! Daddy Pig is bright and cheery, has a big round tummy and a jovial laugh. He only gets a little bit grumpy when he can’t find his glasses! Peppa Pig is a well-established children’s property; 2019 will mark 15 years of Peppa Pig. Peppa Pig has won the award for the Best Pre-School Licensed Property at The Licensing Awards several times, including 2009, 2010, 2012, 2013 & 2014. The television series has also won a Children’s BAFTA for Best Pre-School Animation in 2005, 2011 & 2012. Peppa’s very own theme park ‘Peppa Pig World’ launched at Paultons Park in the UK in April 2011. A Peppa Pig World extension is due for completion in Spring 2018. 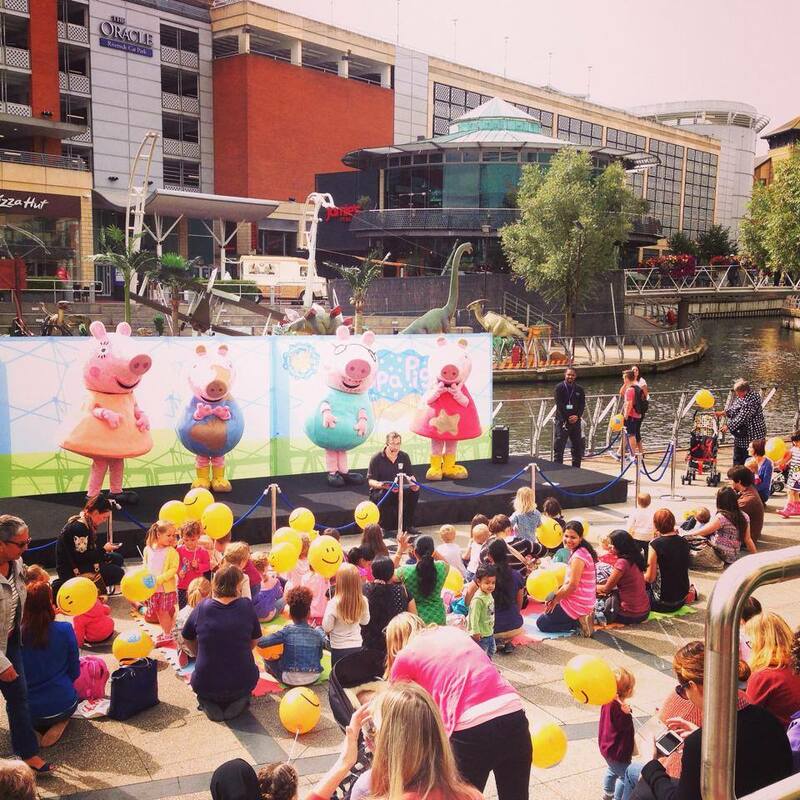 Enhanced activities available to book through Rainbow Productions: Peppa Pig’s Holiday Fun and Peppa Pig’s Muddy Puddles experiential activities. 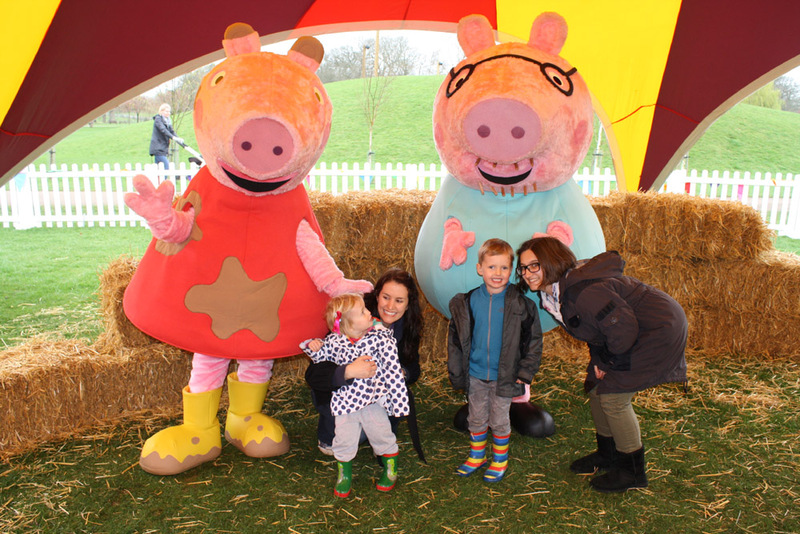 Four splashes or muddy puddles, which offer clues, are hidden around the venue booking this interactive event and children are given postcards on arrival and invited to locate these clues; upon successful completion children receive Peppa Certificates. Personal appearances by Peppa Pig, George, Mummy Pig and Daddy Pig are available to book exclusively through Rainbow Productions to appear at UK events.